The C146 is a combined machine which features two barrels, one vertical above (the heater) and one horizontal below (the batch freezer). This technologically advanced machine is equipped with an LCD screen offering the operator a large selection of programmed capabilities. 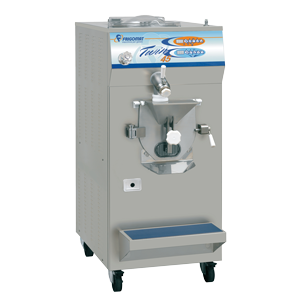 Manufactured in Italy by Frigomat to ensure Italian equipment quality and technology to serve gelato, ice cream or medium overrun frozen desserts. LCD panel: enriches and simplifies the operator’s job. Six freezing programs: automatic freezing cycle to reach the ideal consistency according to the type and quantity of mix introduced; automatic freezing cycle “PLUS” for higher consistency levels; semi-automatic freezing cycle with time setting; semi-automatic freezing cycle with consistency setting; slush cycle with consistency setting and continuous agitation; slush cycle with time setting and cyclic agitation. 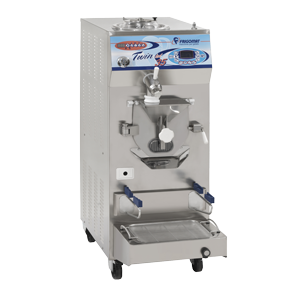 Interactive “flavor” menu with pre-set freezing programs combining every single flavor with its relative agitation mode and consistency level; “flavor modification” function to modify the pre-set parameters; “flavor creation” function to customize and memorize new flavors. Automatic consistency preservation at the end of the cycle. “TURBO” function to increase the agitation during the freezing cycle. The electronic IES features a new consistency control system that further improves the precision during the different working conditions. High production flexibility (from 2.8 up to 10 liter of liquid mix), through the automatic control which manages the freezing cycle in relation to the type and quantity of mix. Highly efficient freezing cylinder with direct expansion gas technology and steel beater with removable flexible scrapers. A rinse faucet fits right into the front panel conveniently located next to the door. Large, adjustable and removable shelf with non-slip pad allows easy dispensing and cleaning for the operator.